Definition: Graves’ disease, also known as toxic diffuse goiter, is a disorder of the body’s immune system in which the body has too much thyroid hormone. It is relatively easy to treat. If left untreated, however, it can have serious consequences. Graves’ disease is an autoimmune disorder that causes hyperthyroidism. The condition occurs when our immune system makes an antibody known as a thyroid-stimulating immunoglobulin (TSI). TSI causes the thyroid gland (located at the base of our throat) to produce too much of the thyroid hormones thyroxine (T4) and triiodothyronine (T3). Signs and symptoms of hyperthyroidism may include irritability, muscle weakness, sleeping problems, a fast heartbeat, poor tolerance of heat, diarrhea, and unintentional weight loss. Other symptoms may include thickening of the skin on the shins, known as pretibial myxedema, and eye bulging, a condition caused by Graves’ ophthalmopathy. About 25 to 80% of people with the condition develop eye problems. Treatment of Graves’ disease is aimed at decreasing the number of thyroid hormones being produced by the thyroid gland, which relieves symptoms of the disease. Depending on the choice of treatment, individuals who are treated for Graves’ disease may have a temporary or permanent remission from Graves’ symptoms. 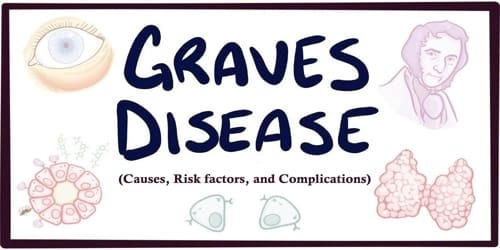 Causes and Risk factors of Graves’ disease: Graves’ disease is caused by a malfunction in the body’s disease-fighting immune system, although the exact reason why this happens is still unknown. While a theoretical mechanism occurs by which stress could cause an aggravation of the autoimmune response that leads to Graves’ disease, more robust clinical data are needed for a firm conclusion. Research suggests that Graves’ disease may be caused by a combination of genetic and environmental factors. Genetic – A family history of Graves’ disease increases the chance of developing the condition, although its inheritance pattern is unknown. Environmental – People are much more likely to develop Graves’ disease if they smoke. Graves’ disease occurs when antibodies connect to the thyroid cells’ surfaces. The antibodies stimulate cells to overproduce thyroid hormones, resulting in an overactive thyroid. Emotional stress can trigger Graves’ disease in some patients. Most people with Graves’ disease, however, report no specific stressful events. Emotional or physical stress. 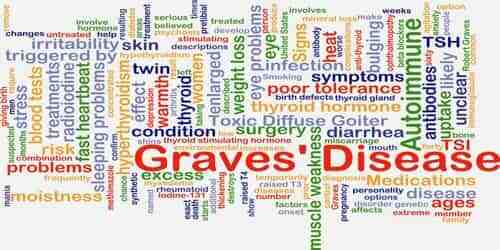 Severe stress or trauma may trigger the onset of Graves’ disease. For people who have already been diagnosed with Graves’ disease, stress can also cause symptoms to worsen. Other autoimmune disorders. People with other autoimmune disorders have an increased risk of developing Graves’ disease. These disorders can include lupus, pernicious anemia, Addison’s disease, celiac disease, and type 1 diabetes. Smoking. Cigarette smoking, which can affect the immune system, increases the risk of Graves’ disease. Smokers who have Graves’ disease are also at increased risk of developing Graves’ ophthalmopathy. Graves’ disease occurs in about 0.5% of people. It occurs about 7.5 times more often in women than in men. Often it starts between the ages of 40 and 60. 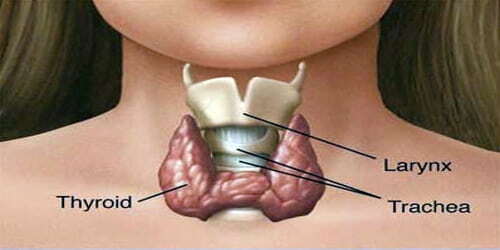 It is the most common cause of hyperthyroidism in the United States (about 50 to 80% of cases). If the eyes are proptotic (bulging) enough that the lids do not close completely at night, dryness will occur – with the risk of a secondary corneal infection, which could lead to blindness. Pressure on the optic nerve behind the globe can lead to visual field defects and vision loss, as well. Prolonged untreated hyperthyroidism can lead to bone loss, which may resolve when treated.